It was a day of full bad news right from US economy data to rising Spain and Italy yield, but the market survived initial shocks before selling of mid day. Spain was downgraded 3 notches by Moody and Egan jones. Greece are running up on the banks and withdrawing over 1 billion a day. Dow moved up 80 point from its morning lows and then gave up 130 point before rallying 40 point at the close. S&P500 moved up 11 point from its morning lows and then gave up 17 point before rallying 4 point at the close. S&P500 is now at its most important key break point on the downside. If it survives the breakpoint, short term market is going higher but if it fails it will retest 1298 followed by 1282 resistance. Ideally based on the chart tomorrow, market should open little higher or flat but close low. Expect volatility to rise. So watchout UVXY, VXX and TVIX. 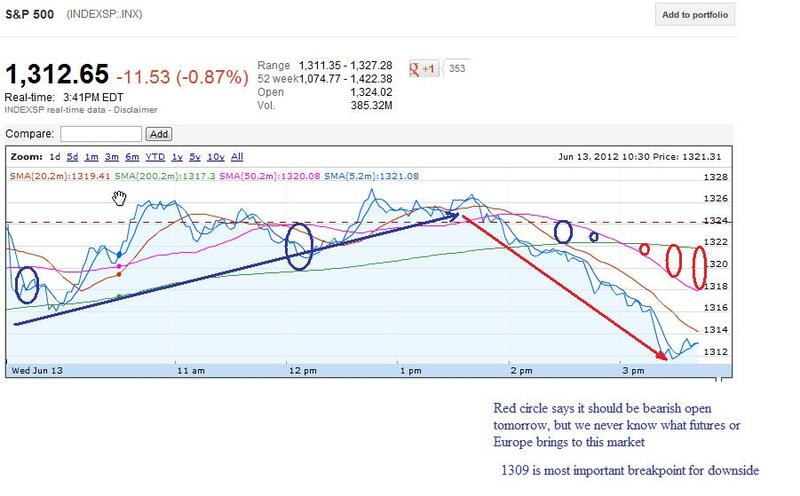 For Bullish sentiment to continue: Dow needs to break 12570 while S&P500 needs to break 1318. Expected market to sell off on rally. 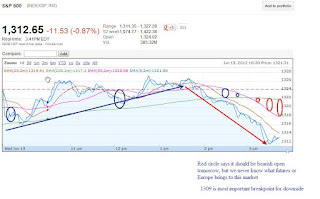 If possible avoid this market till Greece election and FOMC meeting are over.